« 23. Passover – Which 7 Days? Then, after quoting both Exodus, 12:18-19 and 12:15,10 as proof, he challenges some of the more recent innovations. On the other hand, he chastised those in the West who kept the festival from the 15th to the 21st day of the first moon, not only with regard to their allowing that Passover could be celebrated as late as the 21st day of the first moon but in the manner in which they calculated the seven days of Unleavened Bread. 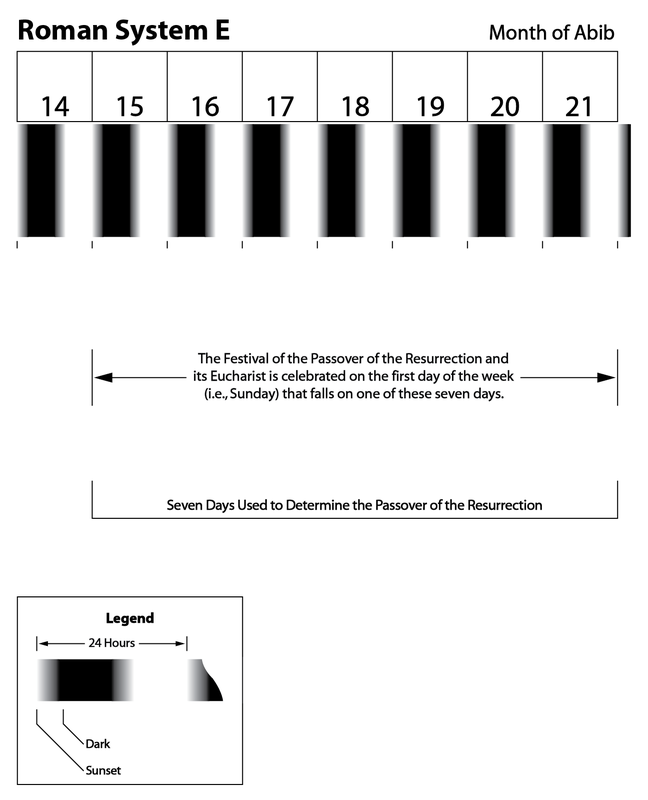 The Passover of the resurrection, accordingly, was always placed by them on the first day of the week which fell on one of the seven days of Unleavened Bread, a period calculated from the beginning of the 15th until the end of the 21st day of the first moon. In his calculation, Anatolius refers to the 14th as both the first day of Unleavened Bread and as the day on which the messiah ate the Passover. His point of reference, therefore, is a scripturally-based method. He goes on to oppose the view that the seven days of Unleavened Bread were to be counted from the 15th to the 21st. Anatolius not only accuses the advocates of the Roman System E with ignorance of the truth and with not understanding the meaning behind those scriptural passages which state that the seven days of Unleavened Bread continue from ad vesperum (at twilight) of the 14th day of the first moon “usque (until)” (the beginning of) the 21st day of the first moon ad vesperum (at twilight),22 but he criticizes the calculators from Gaul and other regions with a further misunderstanding. This system was used by the pagans and was based upon the fact that the Roman civil day began at midnight. Since the new moon both rose and set after sunset and prior to midnight, they calculated the days of the moon as the first, second, and so forth, day AFTER the day (midnight reckoning) of the appearance of the new moon. Therefore, since the new moon appeared after sunset and the civil day did not end until midnight nor the common day until dawn, for the purposes of counting to Passover, the first day of the new moon was actually the “day after” the Roman day on which the new moon had made its appearance. As a result, the days of the moon, as reckoned by the Egyptians, Romans, and people of Gaul, were not the same as the days of the moon as reckoned by Scriptures. The first day of the moon in Scriptures begins with the rising of the new moon just after sunset. It does not begin a few hours later at midnight or with the next morning following the appearance of the new moon. 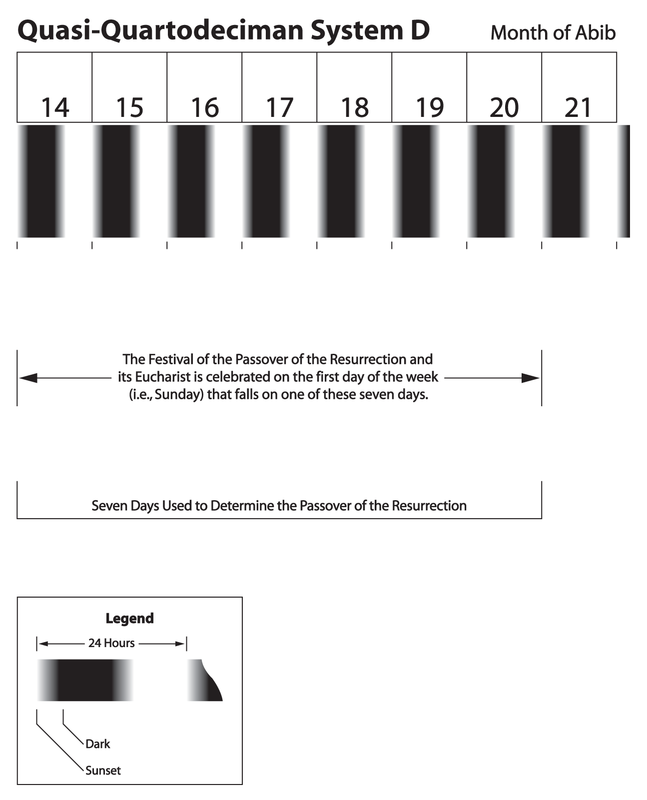 Therefore, to correctly calculate Passover, one must determine the days by the scriptural “reckoning of the moon” (i.e., counting the days from sunset to sunset) against the reckoning of the days of the Egyptians and Romans or many of the common people (i.e., counting the days from midnight to midnight or from sunrise to sunrise). Those following the midnight reckoning of the Romans or the sunrise reckoning of the common people did not take this factor into consideration. 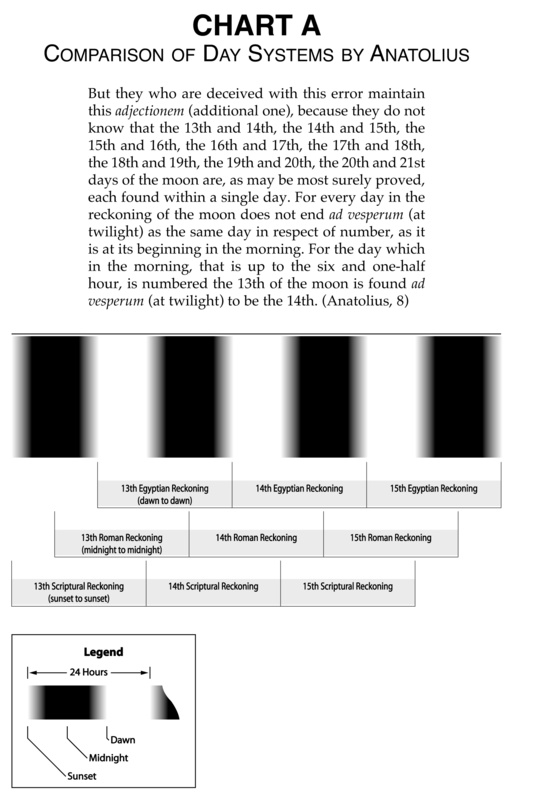 This evidence proves that Anatolius, as articulated in System A, believed that the correct scriptural system makes the day of the moon begin ad vesperum (at twilight), which, as we have already demonstrated earlier, commences at sunset. Accordingly, the seventh and final day of Unleavened Bread comes on the day when the morning is counted as the 20th of the moon under the Egyptian system, ending at sunset, when the 21st (scriptural) day arrives. In turn, Anatolius reasoned that the seven days of Unleavened Bread extended from the beginning of the 14th scriptural day, i.e., at sunset, ad vesperum (at twilight), on the 13th Egyptian day, UNTIL (as far as the beginning of) the 21st scriptural day. The 21st scriptural day begins at sunset, ad vesperum (at twilight), on the 20th Egyptian day. What makes the record from Anatolius so important is that he admits that the Quartodeciman practice was the original system of the early Jewish priests, such as Aristobulus of Paneas (System A), and of the early disciples of the messiah. His argument is also premised on the fact that System D was the practice of the western Christian assemblies after abandoning System A, while System E was an even more recent innovation. Nevertheless, the Alexandrian and Roman Catholics held fast to their belief that the seven days of Unleavened Bread, by which the festival of Passover should be determined, was to be celebrated on the first day of the week falling within the period from the 15th to the 21st day of the first moon. They utterly rejected the seven days of System D. System D was branded a heresy and condemned as a Quartodeciman practice. The Audians represented an early fourth century C.E. adherence to a form of the System D format which, along with the Quartodeciman view, was actively being suppressed by the Roman emperor Constantine at the Council of Nicaea in 325 C.E. In other words, the Audians allowed for the 14th as a day of Unleavened Bread and as the Passover, for they did not observe the same seven days as the Pharisees. Their brethren, of course, were Christian Judaeans (not those of the Jewish faith), a clear reference to the early Quartodecimans and their keeping of the 14th. The advocates of System E accused the Audians of Judaizing and ridiculed their view as antithetical to unity. The effort of the Roman Catholic assembly was to eliminate the differing opinions of the various assemblies and the Aud­i­ans were standing in the way. It is interesting that even Epiphanius considers the observation of the 14th the original Christian position, thereby making the Roman Catholic System E (which regards the 15th as the legal day of the Passover supper) a later Christian innovation. What the Audians were claiming was that, prior to Constantine’s decrees given at the Council of Nicaea (325 C.E. ), the 14th was permitted as the first day of Unleavened Bread and was used by different assemblies in their calculation of the day of Passover. This mutual respect had remained in the assemblies since the time of the great debate between Anicetus of Rome and Polycarp of Asia (c.158 C.E.). These leaders had agreed to disagree as to which day the Passover Eucharist was to be celebrated and the Roman assembly agreed to live in peace with those who kept the 14th. Further proof of the System D arrangement, which reflected the Quarto­deciman view for the seven days of Unleavened Bread, was also retained in records from assemblies who continued until the eighth century C.E. but were stationed in outlying areas of the Roman empire. The famous Saxon historian Bede (673-735 C.E. )—himself a Roman Catholic who opposed System D and followed System E—also makes reference to the Quartodeciman-based view of System D used in Britain. Wilfrid’s attempt was to separate those following System D from the apostle John and the early Quartodecimans (System A). Yet, by doing so, he actually reaffirmed that the only difference between these two camps, with regard to counting the seven days of Unleavened Bread, was to point out that the early Christians always kept the 14th as the Passover. 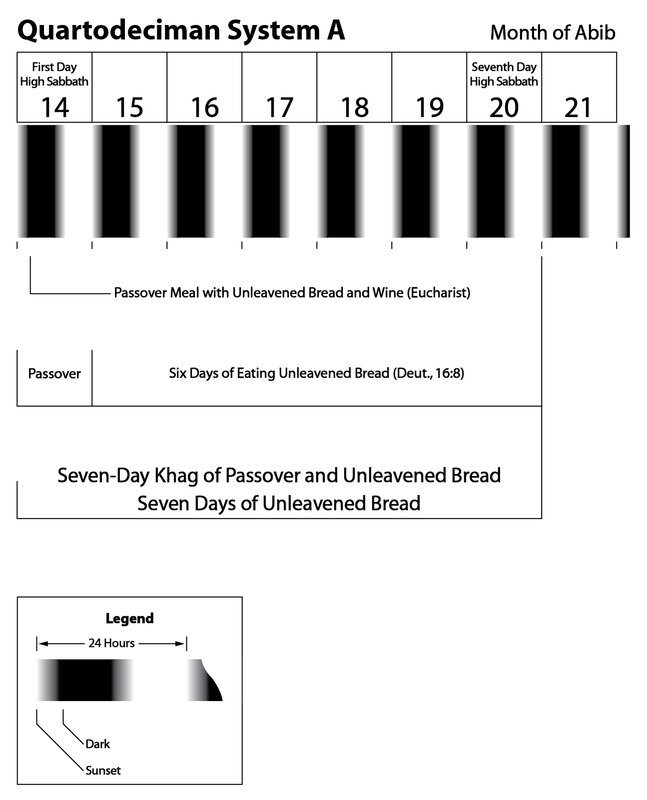 Since John observed the week of Passover according to the Mosaic law, it is also clear that he kept both the first and last day of the week of Unleavened Bread as a high Sabbath. This fact is yet another indication that the Quartodecimans did likewise and that they based their view upon the Aristocratic interpretation for the week of Unleavened Bread. Those of System D refused the 21st because they believed that the seventh day spoken of in the Torah was the 20th. Though they themselves did not observe the first and last day of Unleavened Bread as a high Sabbath, unless the Passover of the resurrection happened to fall on one of these days, this detail does indicate that the Quartodecimans, upon whom the System D construct was built, did observe these days. The evidence proves that the original view of the seven days of Unleavened Bread used by the early Christian assemblies was the Quartodeciman (Aristo­cratic) System A practice. In this system the seven days of Unleavened Bread continued from the beginning of the 14th until the end of the 20th day of the first moon. The first day, the 14th, was the Passover supper and a high Sabbath. System D, developed by the orthodox Christians of the West during the early second century C.E., was built upon the same premise as System A, i.e., that the seven days of Unleavened Bread extended from the beginning of the 14th until the end of the 20th day of the first moon. It differed in that its advocates preferred to celebrate the joyful event of the messiah’s resurrection and not the sad occasion of his death. Therefore, those following System D moved the celebration of the Passover supper up to the first day of the week that fell within the seven days of Unleavened Bread. Yet, the key to System D is that it was born from the Quartodeciman construct for the seven days of Unleavened Bread. Eventually, both the Quartodeciman System A and quasi-Quartodeciman System D practices were eventually suppressed by the Hasidic-based System E, developed and advocated by the Roman assembly toward the end of the second century C.E. We can conclude this particular discussion knowing that more than enough evidence has been provided to demonstrate the true practice of Passover and Unleavened Bread by the early Christian assemblies who also claimed apostolic authority for doing so. We will next tackle the subject of Roman influence on Passover and Unleavend Bread. So be on the lookout for 25. Passover – Roman Corruption. 1 He is also commonly called Anatolius of Laodicea. 2 Eusebius, H.E., 7:32:6-12; Jerome, Lives, 73. 4 Anatolius, 3. Socrates Schol., 5:22, (writing about 439 C.E.) points out that even in his day the practices of the “modern Jews,” that is, the Jews of his day, were at odds with those of the “ancient Jews,” including the first century C.E. Pharisees like Josephus. 6 OTP, 2, p. 837, n. a. 7 Anatolius, 1, 7, 11, 12, 15. 10 Anatolius, 8; cf., Lev., 23:6. 11 See our discussion in 25. Passover – Roman Corruption. 15 Matt., 26:17-27:61; Mark, 14:12-15:47; Luke 22:7-23:54; 1 Cor., 5:6-8, 11:17-27. 16 We will address in our forthcoming posts. 22 Anatolius, 7, 9, 11, 16; cf., his use of ad vesperum in translating Exod., 12:15, 18-19 (Anatolius, 8). That Anatolius counts the seven days of Unleavened Bread by this method is confirmed when he writes that these seven days continue “from the end of the 13th day of the moon, which marks the beginning of the 14th, on to the end of the 20th, at which the 21st day also begins” (Anatolius, 8). 23 Macrobius, Saturn., 3:14-15, “vespera follows” sunset. See 13. Passover – Hasidic Practice II, n. 9. 25 Wilfrid tries to confuse the issue by interpreting the words of Anatolius in such a way as to include the 21st, stating, Anatolius “also assigned the 20th day to the sovereign’s Passover in such a way that he held it for the 21st when the sun had set.” Of course, this was not the intent of Anatolius. Anatolius was trying to show that those keeping the Egyptian method for determining a day erred in that they should not be observing Passover beyond sunset of the Egyptian 20th day, because in that case it had become the 21st scriptural day. 28 Pliny, 2:79; PCAE, p. 10; HBC, p. 8. 30 Columella, 2:10; HLD, p. 1085. 31 Pliny, 2:79; CGS, p. 589. 37 See 13. Passover – Hasidic Practice II, n. 9. 39 The early Latin text reads xii but clearly, as all translators agree, is a scribe’s error for xiii. 41 HCC, pp. 298-332; NCE, 5, p. 8. For the acceptance of Anatolius by the Roman Catholics also see the comments in Bede, 3:25. As a result of the acceptance of several important parts of Anatolius’ conclusions, the Roman theologian, Jerome, applauds him, writing, “We can get an idea of the greatness of his genius from the volume which he wrote On Passover and his ten books On the Institutes of Arithmetic” (Jerome, Lives, 73). Eusebius, in his Historia Ecclesiastica, also praises Anatolius and even records a long quote from a portion of his book on the Passover. 45 DPDQ, pp. 16-18; ACC, 2, p. 1150. 48 Epiphanius, Pan., 70:10:5; cf., Eusebius, H.E., 5:12:1-2. 51 E.g., see Socrates Schol., 5:22; Eusebius, H.E., 5:24:16-17. 52 We will address in our forthcoming posts. 54 Bede, Hist., 2:2. If the 14th of the moon after the spring equinox fell on Sunday the Britons would keep Passover on that day; the Roman Catholics would defer it to the following Sunday. This entry was posted on 02/07/2013, 2:38 pm and is filed under Calendar, Easter, Feast Days, High Sabbaths, Holy Days, Passover, Quartodecimans, Religion, Scriptural Calendar, Tekufa, Tekufah, Tequphah, Tequphath, Unleavened Bread, Vernal Equinox, Yahweh. You can follow any responses to this entry through RSS 2.0. You can leave a response, or trackback from your own site.